Wayang Kulit, Javanese shadow play. Under the artistic direction of Pak Sardono, the Indonesian pavillion at Expo ’86 presented daily concerts of Indonesian dance, music and theatre. 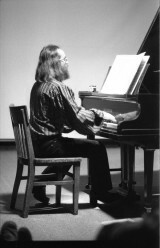 Since Martin Bartlett had already been teaching world music including Indonesian at Simon Fraser University for some time, a natural rapport was established. The company had come prepared to present full scale shadow theatre (wayang kulit), four hours long, which was impractical in the Expo context, so this event was arranged at the Front. Dalang Blacius Subono performed the piece, Dewa Ruci. Full gamelan, singing and a gorgeous collection of puppets combined with audience sitting on the floor, babies asleep, a couple of dogs and a hot June night to give this memorable event an authentic tropical atmosphere. After Expo closed, the government of Indonesia generously donated the gamelan to SFU and that is how the Vancouver Community Gamelan, Kyai Madu Sari, or Venerable Essence of Honey, was born.